The statutory scheme for dealing with complaints of family violence is set out in the Family Violence Protection Act 2008. Case law concerning the operation of this new Act is still rare. Some magistrates (who are tasked with applying the Act by considering applications for intervention orders) express disquiet over the way the system operates. Orders are commonly made in the absence of the respondent, one of the people most directly affected by the granting of an order. In many cases when the respondent does attend court to object to the making of an order, they are either not in a position to, or are expressly not permitted to, call evidence on their behalf before an interim order is made. For some magistrates, who themselves studied and practiced law under a different set of rules, this sometimes appears contrary to long-standing principles of procedural fairness. Of course this is also a view shared by many respondents, though few challenge the decision of a magistrate to grant an intervention order. Avenues of review lie both to the County Court under Division 9 and also to the Supreme Court in its common law jurisdiction to issue writs of certiorari and mandamus. In Zion-Shalom v Magistrates' Court of Victoria at Heidelberg (No 2)  VSC 477 the respondent challenged the making of an interim intervention order on two grounds. First, he argued that as a matter of fact he was not and never had been a family member of the complainant, who was merely a residential co-tenant and business associate. This was contrary to what the complainant had stated, which was that the relationship had been of a sexual nature (though this had finished by the time that events leading to the complaint occurred). 6 I do not agree that her Honour, sitting at the Magistrates’ Court at Heidelberg - which exercises the family violence jurisdiction conferred by s.4H of the Magistrates Courts Act – did lack jurisdiction. It is not in contention that, pursuant to s.26 of the Family Violence Protection Act, a family violence safety notice was issued by an appropriately senior member of Victoria Police. By s.31, such a notice is taken to be an application by the police for a family violence intervention order for the alleged victim against the alleged perpetrator of violence. It is also by that section taken to be a summons for the latter to appear in the Magistrates' Court on a date stated in the notice. Once those preconditions have been fulfilled, the Magistrates' Court has jurisdiction to determine the application. Indeed, it is provided by s.51(1)(c) [I believe His Honour intended to refer to s 53(1)(c)] of the Act that the court may make an interim intervention order if a family violence safety notice has been issued for an affected family member and the court is satisfied, on the balance of probabilities, that there are no circumstances that would justify discontinuing the protection of that person until a final decision about the application. 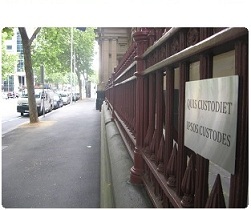 The court does not have to ask itself whether the person for whom the notice is issued is properly within the category of an affected family member, because by s.4 of the Act one of the definitions of such a person is "a person the subject of an application for a family violence intervention order to protect the person or the person's property". 7 In this case it is not contested that the alleged victim was a person the subject of such an application. The conditions for jurisdiction were therefore made out. Accordingly, the magistrate had jurisdiction to make an interim order, and indeed had no option but to deal with the application. This ground for my making an order in the nature of certiorari must therefore fail. The second ground advanced was an absence of procedural fairness occasioned by the refusal of the magistrate to allow the respondent to call evidence on the interim application. 8 It is next submitted on behalf of the plaintiff that he was not accorded procedural fairness or, to adopt the now almost discarded description, natural justice. His counsel, acting as his mouthpiece, was permitted to put orally to the magistrate the evidence which it was anticipated he would give were he to be called; but he was not allowed to be called himself, and his counsel was not allowed to cross-examine the alleged victim. The magistrate explained her position by saying that she did not have time to follow that course. The plaintiff does not suggest that her Honour’s explanation was inaccurate. 9 The Act explicitly provides, by s.54, that an interim order may be made whether or not the respondent (that is, the alleged perpetrator) has been served with a copy of the application for a family violence intervention order and whether or not the respondent is present when the interim order is made. It follows that an interim order may be made without hearing the respondent. 10 The plaintiff nevertheless submits that if he is present he must be heard. This submission encounters an immediate problem. It is clear that on an application for an interim order a full hearing is not necessary. Indeed, it may not be possible or even appropriate. Where, then, is the line to be drawn? In this case, a magistrate allowed some five minutes for counsel to obtain instructions from the plaintiff. Counsel then put to the magistrate what, on those instructions, the plaintiff would have said in evidence in chief had he given evidence. It follows that the plaintiff was given a hearing of sorts, albeit not one which would satisfy the criteria as laid down by the authorities for a fair trial. But – and the distinction is vital - an application for an interim intervention order is not a trial. 11 The importance of the distinction is reflected in the legislation itself. A final order may only be made if the court is satisfied on the balance of probabilities that the alleged perpetrator has committed family violence against the affected family member and is likely to do so again: s.74(1). By contrast, s.53 provides for a number of circumstances in which an interim order may be made, including those set out in s.53(1)(c). As I have already noted, this provides that the court may make an interim order if a family violence safety notice has been issued for an affected family member and the court is satisfied on the balance of probabilities that there are no circumstances which would justify discontinuing the protection of the person until a final decision about the application. Again, there is no obligation upon the affected family member (that is, the alleged victim) to give evidence before the interim order is made: s.55(2). In addition a registrar of the court must give both the alleged perpetrator and the alleged victim a written explanation of the interim order: s.57(1). That explanation must cover a number of matters, including the means by which the interim order may be varied or extended and the process for deciding the final order. If an interim order is made, the court must ensure that the hearing is listed for a decision about the final order as soon as practicable: s.59. Finally, by contrast to the position on the hearing of an application for an interim order, a contested application for a final order may be heard on an a mention date, but only if: (a) the court is satisfied that all the parties to the proceeding have had an opportunity to seek legal advice and legal representation, and have consented to the hearing of the contested application on the mention date; and (b) it is fair and just to all parties to hear the application on that date: s.61(1). 12 An important conclusion, which I think necessarily follows, is that the legislation does not require, before an interim intervention order may be made, that any alleged family violence be proved. In this case, once the magistrate was satisfied that the appropriate family violence safety notice had been issued for a person the subject of an application for a family violence intervention order to protect that person, she only had to be satisfied of one other thing; namely, that there were no circumstances that would justify discontinuing the protection which the notice gave to that person. In this case, her Honour was so satisfied, albeit on material that would not allow her, were she hearing a proceeding for a final order, to be satisfied to the requisite standard that the plaintiff had committed family violence against the alleged victim. It is not for the court to prescribe, as conditions necessary if procedural fairness is to be accorded, conditions which are inconsistent with those prescribed by parliament. It seems to me that, were I to accede to the plaintiff's application for certiorari, I would fall into that trap. His Honour reasoned that, since the statute expressly provides that an application can be heard and granted in the respondent's absence, there was nothing unfair about refusing the respondent's request to call evidence or cross-examine. The application for certiorari and mandamus was refused. I dunno about that last quote from Harper J, in light of today's decision of the High Court to the effect that it's not for Parliament to tell a court (at least one that is capable of exercising federal jurisdiction) how to manage its processes. I'm reading International Finance v NSW Crime Commission at the moment. Interesting stuff. I'll probably have more to say about it in a post next week. I thought your question about the Parole Board on Tuesday night was good. A shame it didn't really get an answer.